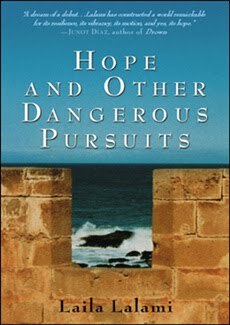 Laila Lalami's collection of short stories titled "Hope and other Dangerous Pursuits" was suggested to me by a friend while I was searching for contemporary writings on 'the immigrant experience'. Lalami's stories proved to be quite the page turners, with a delectable cast of characters sharing a common dream of making it out of Morocco in search of a better future. The theme of illegal immigration in pursuit of better opportunities, is pretty common and well rehearsed, and yet its manifestation in Laila Lalami's compilation of short stories was unique. Foremost of all, the setting for the entire collection is Morocco and Spain, both exotic places from the western reader point of view; the fact that all the main characters are Muslims gives to the reading a 'flavor-of-the century' status . Lalami is clearly aware that "the issue of religious fundamentalism is constantly present in the news media", and so readers have a "particular expectations of these kinds of stories". It was therefore remarkable the way Lalami was able to manipulate those reader expectations through some clever writing techniques. She achieves ultimate objectivity as a writer when she presents one character through two different stories , each with a different point-of view. As a result we see Faten, the headscarf wearing 19 year old presented through the eyes of Larbi, the fiercely protective liberal father of Noura in "The Fanatic ", and a few stories later, in "The Odalisque" we see her again, but this time it's through her own eyes, and in different circumstances. Indeed, a smart literary ploy to break the stereo type of burqua clad women. Faten could so easily have been denigrated by readers as the manifestation of the writer's bias towards or against the emergence of religious fundamentalism among Islamic Women, but Lalami did not let that happen. Instead she used the dual 'point-of-view' technique to bring innate depth and credibility to her characterization. Going forward, the reader now has greater trust and respect for Lalami's portrayals of situations and also for the characters that inhabit those situations. Laila Lalami is extensively traveled and has also lived in different parts of the world. Her global personality does infiltrate into her writings, and sometimes to her disadvantage. There are times when she appears reticent to commit, especially on issues pertaining to religious fundamentalism and gender discrimination. She has a couple of 'undefined' characters in these short stories that defy any rational explanation like Noura's mother Salma in "The Fanatic", or Haalima's husband, Maati, in "Busrides". It's almost as if Lalami leaves it to the reader to make-what-you-want out of these undefined characters. Why Maati tortures and terrorizes his wife Haalima in "Busrides", and then just hands Haalima the divorce and lets her go in "The Saint" is rather puzzling. In "The Fanatic" why Salma chooses to be a bystander even as Noura, her daughter, is being pulled into radicalized religion by a newly found friend, is hard to rationalize. Ms. Lalami could well have masterminded this obscurity, and for one of two reasons, perhaps. One, that she didn't want to ruffle touchy feathers in the radical Islamic world, like Taslima Nasreen and Azar Nafisi did, or else, Ms Lalami deliberately left a gap for readers to bridge on the basis of their own levels of awareness. For instance, when I was reading " The Fanatic", I saw Salma as an incompetent mother who being overwhelmed by the demands of her profession, neglects her teenage daughter. Salma's gender or ethnicity did not come up for me at all; she could well have been a Janet of an American short story. Similarly, Matti, who left undefined by Lalami, became for me the stereotypical abusive husband, who unable to deal with his own insecurities, was venting frustration on his wife. Lalami cleverly left it to her readers to define such deliberate ambiguities, knowingly or otherwise investing the reader in her storyline. If, indeed that was her plan, then that was some fine literary craftsmanship. Reading Llami's stories reminded me of other contemporary writers who too have written about the immigrant experience. For example: Adichie, Cisneros, Lahiri, Loraine Adams and Malladi, all of who have stories to tell about lives being uprooted and then the tortuous replanting of those lives on foreign soil amid a strange and often hostile environment. The 'immigrant experience' has set many a creative mind aflame, but what determines the success of a piece is whether the passion of the writer carries across to the reader, and in Ms. Lalami's case it certainly does. Your book reviews nearly always are a powerful encitement to get it and read it. Same for this case. I'll try to find out in which language the original is written. Could well be in French.